Pancham has been on my daughter’s “To Do” list that she made for me two Christmas’ ago. It took a customer on Etsy asking me to make him to finally get it done. 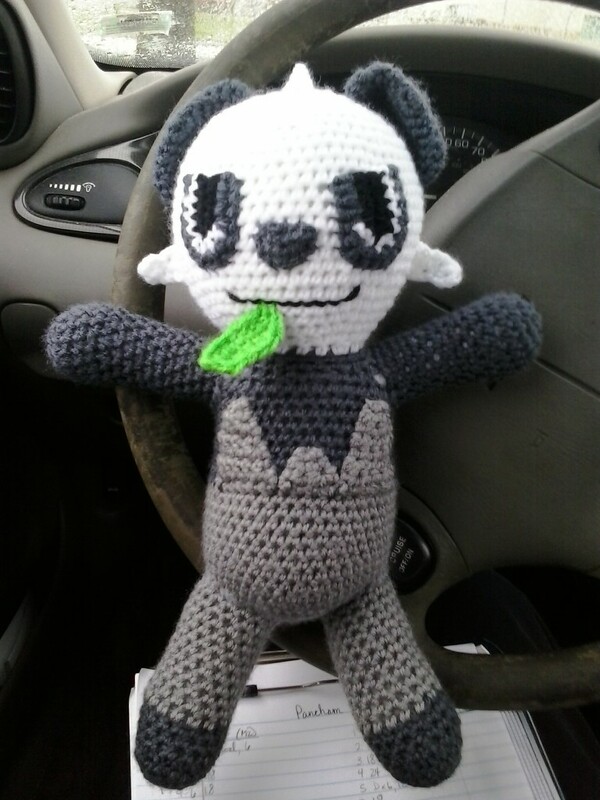 I had made Pangoro about a year ago for another Etsy customer. This pattern includes the colors lists for both Pancham and Shiny Pancham. Worsted Weight Yarn (Shiny colors in parenthesis): Charcoal (coffee brown), greybeard (café latte), white, spring green (green), and black. Finish off. Weave in ends. Stuff ARMS firmly. Rds 6-7: sc in each sc around. (18) Change to greybeard after Rd 7. Finish off. Weave in ends. Stuff LEGS firmly. Rd 2: 2 sc in next sc, holding next sc on BODY and sc #14 on right LEG together and working through both thicknesses, sc in next 2 sc, 2 sc in next sc on BODY, holding next sc on BODY and sc #6 on left LEG together and working through both thicknesses, sc in next 2 sc. Rd 3: 2 sc in next 2 sc, sc in next unworked sc on LEG, working behind same LEG, sc in next sc, ch 1, sc in next sc, skip next 12 sc on same LEG, sc in next sc, 2 sc in next 2 sc on BODY, sc in next unworked sc on LEG, working behind same LEG, sc in next sc, ch 1, sc in next sc, skip next 12 sc on same LEG, sc in next sc. Rd 4: 2 sc in next sc, sc in next 2 sc, 2 sc in next sc, sc in next sc, sc in next skipped sc on LEG, working behind same LEG, sc in next sc, ch 2, sc in next sc, skip next 10 sc on same LEG, sc in next sc, sc in next sc on BODY, 2 sc in next sc, sc in next 2 sc, 2 sc in next sc, sc in next sc, sc in next skipped on LEG, working behind same LEG, sc in next sc, ch 2, sc in next sc, skip next 10 sc on same LEG, sc in next sc, sc in next sc on BODY. Rd 5: 2 sc in next sc, sc in next 4 sc, 2 sc in next sc, sc in next 2 sc, sc in next skipped on LEG, working behind same LEG, sc in next sc, ch 3, sc in next sc, skip next 8 sc on same LEG, sc in next sc, sc in next 2 sc on BODY, 2 sc in next sc, sc in next 4 sc, 2 sc in next sc, sc in next 2 sc, sc in next skipped on LEG, working behind same LEG, sc in next sc, ch 3, sc in next sc, skip next 8 sc on same LEG, sc in next sc, sc in next 2 sc on BODY. Rd 6: sc in next 11 sc, sc in next skipped on LEG, working behind same LEG, sc in next sc, ch 4, sc in next sc, skip next 6 sc on same LEG, sc in next sc, sc in next 14 sc on BODY, sc in next skipped on LEG, working behind same LEG, sc in next sc, ch 4, sc in next sc, skip next 6 sc on same LEG, sc in next sc, sc in next 3 sc on BODY. Rds 8-15: sc in each sc around. (42) Change to charcoal after Rd 15. Rd 24: holding next sc on BODY and first sc on ARM together and working through both thicknesses, sc in next 4 sc, sc in next 6 sc on BODY, sc2tog, sc in next 5 sc, holding next sc on BODY and first sc on ARM together and working through both thicknesses, sc in next 6 sc, sc in next sc on BODY, sc2tog, sc in next 8 sc, sc2tog, sc in next sc, holding next sc on BODY and sc #11 on first ARM together and working through both thicknesses, sc in next 2 sc, sc in next 4 sc. Rd 27: (sc in next 6 sc, sc2tog) around. (21) Change to white. Finish off leaving a long tail. Weave tail through sc of Rd 53, pull tightly and secure. Weave in ends. Finish off leaving a long tail. Sew EARS to head of BODY in a half-moon shape. Finish off leaving a long tail. Weave tail through sc of Rd 9, pull tightly and secure. Sew TAIL to BODY. Finish off leaving a long tail. Sew SHORT BODY TRIANGLE to BODY. Finish off leaving a long tail. Sew LARGE BODY TRIANGLES to BODY. Finish off leaving a long tail. Sew NOSE to head of BODY. Rd 1: With black, ch 5, sc in second ch from hook, sc in next 2 ch, 4 sc in next ch working around ch, working in free loops of foundation ch, sc in next 3 ch. (10) Change to white. Rd 2: Ch 1, turn; sc in next 4 sc, 2 sc in next 2 sc, slip st in next sc, leaving remaining sc unworked. Rd 3: Attach charcoal in first unworked sc of Rd 1, ch 1, sc in next 4 sc, 2 sc in next 4 sc, sc in next 4 sc. Finish off leaving a long tail. Sew EYES to head of BODY. Using black, embroider MOUTH on head of BODY. Rw 1: With white, ch 10, sc in second ch from hook, hdc in next ch, (dc, ch 2, slip st) in next ch, [sc in next ch, hdc in next ch, (dc, ch 2, slip st) in next ch] twice. Finish off leaving a long tail. Sew MOHAWK to head of BODY. Finish off leaving a long tail. Sew SIDEBURNS to head of BODY. Rd 1: With spring green, ch 8, sc in second ch from hook, hdc in next 3 ch, dc in next 2 ch, 2 hdc in next ch working around ch, working in free loops of foundation ch, dc in next 2 ch, hdc in next 3 ch, slip st in next ch, slip st in first sc. Finish off. Sew LEAF to head of BODY. Pancham, Shiny Pancham and Pokemon are copyright Nintendo and their respective creators. This pattern is an original pattern and is © by Christjan Bee (March 2018). Please do not claim this pattern as your own. If you wish to share this pattern, you may link to this pattern but please do not reprint it on your site. You may keep a copy for your own personal use; but you may not sell or distribute it, or sell items made from this pattern.